Cryotherapy provides new pre and post-workout treatment. To look at Matt Taylor, one would quickly deduce he is no stranger to the gym. An avid weightlifter, Taylor has dealt with the aches, pains and injuries that come with vigorous exercise. About two years ago, he came upon a new way to deal with his ailments that has also inspired a new business venture and brought to Columbia an approach to healing that is still quite new to the United States. 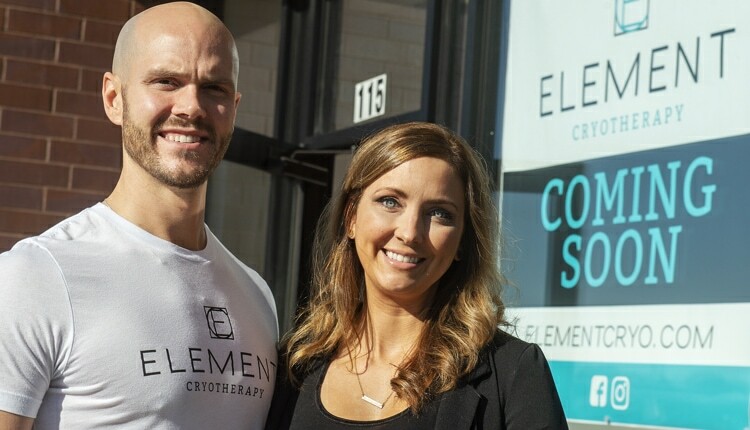 “I learned about cryotherapy from a few gyms and a few retail facilities that do it, and I started doing my re-search from there,” explains Taylor, who co-owns Element Cryotherapy with his wife, Claire. Anybody who has ever held an ice pack on a sore spot for 15 minutes has used a form of cryotherapy. Using cold to treat inflammation that comes with injury and/or sore-ness has been around since the ice age (pardon the pun). Whole-body cryotherapy (WBC) involves the use of liquid nitrogen to produce air temperatures that would normally be found only at the South Pole and exposing that cold to your uncovered body for two to four minutes a session (you do have on underwear, gloves and feet covers). The intense cold causes the blood to retreat to the body’s core to become re-oxygenated, then the blood flows back out into the rest of the body. It’s that oxygen-rich blood that theoretically provides faster muscle recovery and higher energy levels. WBC first surfaced in the 1970s in Japan, where Dr. Toshima Yamaguchi used it to treat the inflamed joints of patients with arthritis. From there, it gained popularity in Europe. Today, in Great Britain, there are hospitals that use WBC to treat a host of ailments that involve inflammation: fibromyalgia, tendinitis and multiple sclerosis, in addition to plain old muscle strain and soreness. Here in the United States, where WBC is only recently starting to take root, LeBron James and Kobe Bryant swear by its ability to speed up muscle recovery and increase energy. The NBA’s Phoenix Suns and MLB’s Kansas City Royals both have team units for players to use, as does the University of Missouri. With a master’s degree in exercise physiology, Sharp is well educated in several forms of injury healing and recovery, and he has used WBC to treat “about every injury you could imagine.” Sharp also says some of Mizzou’s athletes, even when not sore or injured, will do a session the day before a game to feel their best. There are concerns revolving around harmful, even permanent, effects (frostbite, organ damage, etc.) from being exposed to that kind of cold even for a brief amount of time. “It’s cold, but not to the point you can’t stand it,” Sharp says. Like anything else, he says, as long as the people administering the treatment are well trained and well educated, you are in good hands. Something else that gives Taylor confidence is the town itself. “Knowing that Columbia is a huge fitness community, I felt this was a missing opportunity here,” he says of his new business venture. Taylor is quick to point out that WBC isn’t just for athletes. “You don’t want to focus on one demographic,” he says. In fact, a host of Hollywood elites, including Jessica Alba, Jennifer Aniston, Demi Moore, Daniel Craig and Kate Moss, use WBC for everything from increased energy to skin care and even depression. According to a 2008 study from the National Institutes of Health, WBC did show some success as an adjunct treatment for some depressive and anxiety disorders. The study suggests that the extreme cold has some positive effect on the hormone imbalance that causes such conditions. JAMA Dermatology, a monthly periodical, mentions that a separate study in 2008 found that participants saw improved conditions in their eczema. The belief is that the extreme cold forces skin pores to close, thereby helping to keep out dirt and toxins that are harmful.